I haven't been spending much time in libraries over the past few days so I haven't had internet access for a few days. I had a few mornings of work in Shoshone National Forest southeast of Grand Teton National Park and one morning of work east of Yellowstone National Park so I decided to visit both parks. I visited both parks last summer with my brother and dad but there is definitely many areas I have yet to explore. I like Grand Teton National Park much more than Yellowstone so I spent most of my time exploring it. 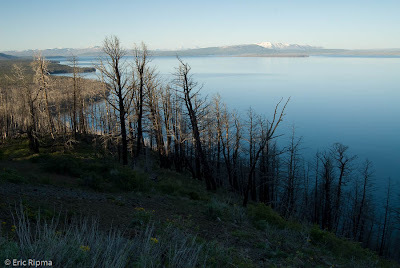 I spent one morning in Yellowstone and birded and photographed around Yellowstone Lake. This lake in the largest mountainous lake in the country. This is the beautiful Yellowstone Lake. I decided to spend most of yesterday at a lake in Grand Teton National Park that is supposed to be good for Calliope Hummingbirds unfortunately I never found one but many other birds were around. I had my first Hammond's Flycatcher and the number of Red-naped Sapsuckers was overwhelming. There were also Barrow's Goldeneyes on the lake and a drumming Ruffed Grouse in one of the Aspen stands. As I was heading back to my car I came over a small hill which happened to be hiding a bear on the other side. I was a little too close for comfort at only about 40 feet. I thought there were two but only got a look at one. They were very close to the trail so I decided to turn around and walk around the lake the other way. As I was headed the other way I ran into three ladies who all had bear spray so I followed them back through the area. On the way back we talked to a few hikers who had come through the area I had seen the bear and nobody had seen it so I thought it must have wandered off. When we were about 500 feet past the area I had seen it the first time I heard something scratching a tree. I turned around and could see a bear through the trees. She was not alone however, she had two cubs with her who had climbed up one of the trees. She was on her hind legs with her paws on the tree her cubs were in and staring in our direction. Luckily, she decided we weren't a real threat and stayed close to her cubs. It was very interesting to know she had been there the whole time and about 15 hikers had gone by that point without realizing they were very close to a family of bears. I had seen bears from inside a car before but until you see one when you are hiking you really haven't experienced a bear in the best way. ...exciting!!! Amazing as well. Good thing you were listening or you might have missed that second encounter. I wonder how often hikers go right past bears without realizing it. Great story!! Great photos!! How in the world did the group not see the bears? I'd love to see one during a hike, from a safe distance of course. Wow! Glad that she decided that you weren't a threat! Yikes! Scary. But fascinating too. We have bears around here but I've never seen one. Yet. But I keep reading in the local paper that people've spotted them all over the place.